British Olympic gold medallist Kat Copeland has decided to carry on with competitive rowing and is targeting the defence of her title at Rio 2016. Copeland, 21, after with Sophie Hosking in London. "University is important, but I can go any time," Copeland told BBC Sport. Fellow champions Heather Stanning, Helen Glover, Pete Reed and Alex Gregory have also committed to Rio. 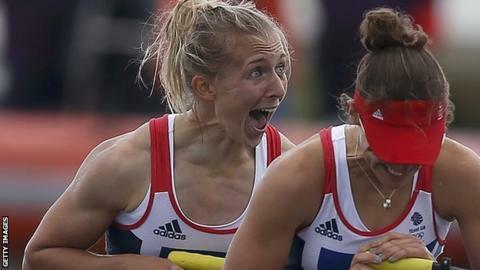 But Kat Grainger and Anna Watkins, who won gold in the women's double scull in London, have yet to announce their plans. Hosking and Copeland's gold medal was one of the shocks of the 2012 Games, given the duo had first competed together just four months before. Copeland started rowing when she was 14 and won gold in the single scull at the World Under 23 Championships in 2011. Last year, she started a degree in biology at Durham University alongside her full-time training regime but left after a few weeks to focus on her rowing. "As a rower you have a limited lifespan so I want to make the most of it," added Copeland. "Before London, I said we had no pressure and had nothing to lose because people weren't expecting us to win gold. "But after winning gold, I still don't feel any pressure because I got what I wanted. I'm continuing because I love to row." and the first British female rowers to win an Olympic title when they triumphed in the women's pair at Eton Dorney. Their future as a pairing was uncertain after Stanning said before the games that she would return to her role in the army. However, GB performance director David Tanner told BBC Sport that while the 27-year-old has rejoined her regiment, she will return after a year to prepare for Rio. Tanner said: "I've been working with those at senior levels of the army to ensure that Heather has a bespoke training programme to ensure she is at full fitness when she returns to the squad." Gregory, will resume training next month. Reed, a double gold medallist, is already back in training, but Triggs Hodge and James have yet to announce their plans. Reed said: "I've moved from London to Henley to carry on training. I know the next four years will be harder than ever, because I'm four years older, but I'm fully prepared for what lies ahead."